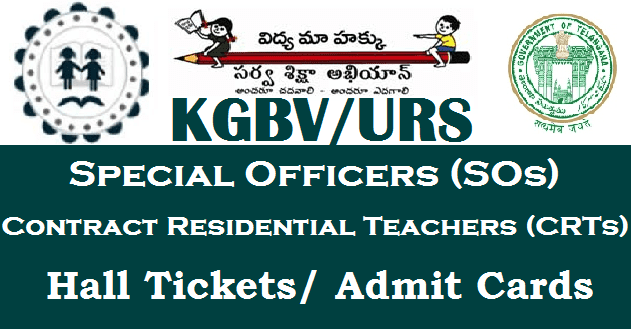 TS KGBV SOs Hall Tickets 2017, TS KGBV SOs, CRTs Hall Tickets 2017, TS URS SOs, CRTs Hall Tickets download,Telangana DSE and Ex-Officio SPD has released a notification for recruitment of Sepecial Officers (SOs) and Contract Residential Teachers (CRTs) in 84 new KGBVs and 29 Urban Residential Schools (URS). Who have successfully submitted the online application the candidates can download the TS KGBV Exam Admit Card from the official website. TS KGBV/ URS Exam will be conducted on schedule date at various centers. A huge number of candidates applied for this examination. TS KGBV/ URS SOs, CRTs Hall Tickets available from 14-06-2017 in official website. TS KGBV/ URS SOs, CRTs Online Application Submission Process was also completed. A huge number of candidates applied for this examination. TS KGBV/ URS written exam will be conducted on 22.06.2017 (10.00 A.M to 1.00 P.M) for URS Special Officers (SOs), 22.06.2017 (02.00 PM to 5.00 PM) for URS CRTs and 24.06.2017 (10.00 A.M to 1.00 P.M) for KGBV Special Officers (SOs), 24.06.2017 (02.00 PM to 5.00 PM) for KGBV CRTs at District level. The Hall Tickets of TS KGBV/ URS Special Officers (SOs), Contract Residential Teachers (CRTs) Recruitment 2017 will be upload on Telangana DSE and Ex- Officio SPD official website by TS KGBV/ URS Officials on or before 14-06-2017. So TS KGBV/ URS SOs, CRTs Hall Tickets available from 14-06-2017 in official website. The written test shall be 3.00 hours duration and will consist of Descriptive type of Questions. The test will be in English Medium for SOs of KGBV and Telugu medium for SOs of URSs the Scheme of Examination is enclosed in Annexure-1. The eligible candidates, who are applied for this recruitment stream, they were waiting for their Hall Tickets. The Candidates can download their Hall Tickets compulsory. This Hall Ticket is entry pass of the examination hall. So candidates should keep their hall ticket while you are going to the examination hall and must read and follow the instructions given on Hall Ticket. Tags:Telangna KGBV Hall Tickets 2017, TS KGBVs SOs(Special Officers), Contract Resource Teachers (CRTs) Hall Tickets 2017, TS KGBVs SOs(Special Officers) Admit Cards, TS KGBVs Contract Resource Teachers (CRTs) Exam dates, Telangana KGBVs SOs, CRTs Recruitment, SOs, Teachers Recruitment in newly formed Telangana KGBVs, Teaching and Non-teaching staff Recruitment in New KGBVs, Urban Residential Schools. Engage the services of Teaching and Non-teaching staff.